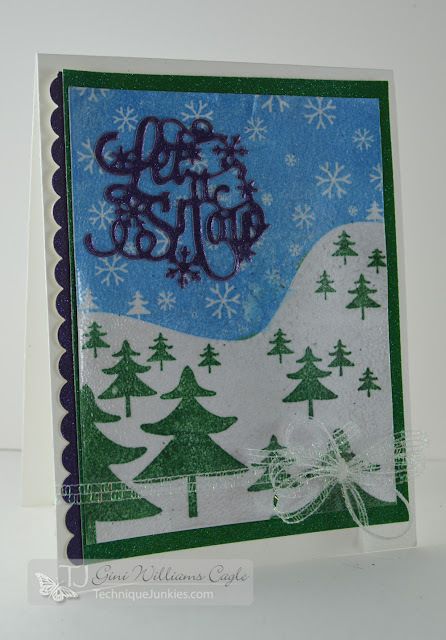 Hi, it's Gini and I'm back for another wintery card to celebrate the 30 Days of Christmas Cards! This was a clean a simple card to make. I stamped the Winter Wonderland with the sky inked blue, and the trees inked green. I inked over the entire image with Versamark and heat embossed with a pearly powder. I die cut the Let it Snow Sentiment and had a quick, but lovely card. We have a few more days of Christmas Cards left, so keep with us for inspiration for your holiday cards.